I was very surprised that Chaparral Winds couldn't handle our situation. My husband went in and he was fine, but they couldnt handle him, and they put him in a hospital before they contacted me and let me know what was happening, so I wasn't happy. The place was clean and had good food. I liked the people, but I don't understand what happened with my husband. Mom lives here. They frequently leave meds around her room. Her room is never cleaned. Chaparral Winds is fantastic. They have just about everything I can think of. The room is a two-bedroom unit and is quite large. We were able to try the food several times, and the staff is more than friendly. The surroundings were very pleasant. There is plenty of outdoor space. It is exactly what we are looking for. Outstanding! Elegant & beautifully maintained, Chaparral Winds offers independent, assisted living & memory care in adjoining buildings. I was VERY impressed with the wonderful, compassionate care they provided for my 96 year old mother during a recent respite stay. They staff is extraordinary - so kind and helpful. Location is ideal, making it easy for visitors to stop by. Food is terrific, there are plenty of activities and guests and visitors are made to feel welcome. Pricewise, it's one of the best values you'll find in the area, I highly recommend Chapparal Winds. We were extremely pleased with the fine care, excellent staff and attractive rooms and campus. Highly recommended! I have visited Chaparral Winds because I go there every week. There’s a gentleman whose care I oversee. Their facility leaves things to be desired. This is an assisted living facility, and they’re supposed to be helping the clients there. It is sad. The food is very good. But as far as the personnel, it is not the same. A few of them spend some time with the clients, but very few of them. And it always smells. It smells like urine, and it seems they could use disinfectant or something. They don’t have too many activities. The gentleman whose care I oversee goes to the Alzheimer’s unit, and he calls out bingo numbers. However, as far as activities at his own place, they have a few physical activities. They do exercise, but other than that, there’s no one that comes in to play the piano, sing, or other things like that. Chaparral Winds Assisted Living was a very nice facility with nice bedrooms and a pool. The staff was very helpful and answered all of my questions. The dining area was big and beautiful. Chaparral Winds Assisted Living has a pool. The place also has an independent living section in which they have separate little homes with garages. I looked at those, and they were really nice. My friend’s mom has a lot of furniture in her room, but other than that, her room is very nice. The food is very good. The staff is very nice and very cooperative. They really like my friend’s mom. They just treat her really well. When she doesn’t feel up to going to the dining area, they bring her meal up to the room. They have exercises that she participates in. They also have movie nights. They have entertainment in which people come in. At Christmas time, they do a whole lot of different activities. She plays cards, and she has taken a few classes, which is nice. We just liked the place and the room, and the pricing structure was better. I live in North Carolina, so I am not there as often, but all the reports I have had been very good. I would recommend Chaparral Winds to anyone looking to place their parents or in-laws. An absolutely beautiful facility! In fact, my husband and I, on visiting this facility with my father in law, both agreed we'd live there. Immaculate. Tons of trees, extraordinary friendly staff and though their web site states three meals per day, we realized it was only two. Meals are served in a cafeteria so each resident is responsible for getting to the cafeteria. My father-in-law is in the early stages of dementia, so this was a slight concern of ours, but we were assured that out of courtesy, staff would remind him of meal times. If taking any medications, it is up to the resident to remember. They are also expected to do their own laundry. My father-in-law stayed in this facility for over one month. He seemed very happy there but as he does suffer from dementia, the staff was unable to provide the services he required. He was often found wandering the hallways. I have to say, the staff, which seems to be available 24 hours per day, were quick to alert us. This is a beautiful, well-kept facility. I know my father in law liked it there. He liked that he could get transportation to nearby stores and he was allowed to keep his cats. Unfortunately this facility didn't work out for us due to my father in law's condition, but I would highly recommend it to anyone who can live on their own and fulfill their basic needs with some assistance. Chaparral Winds Retirement Community offers Independent Living, Assisted Living and Memory Care all on one campus and under one roof. Our Independent Community offers a stress-free rental environment with short term leases at very affordable prices. Luxury apartments surrounded by acres of beautifully landscaped grounds, shaded walkways, and a large lap pool are all within our secure, gated community. The Assisted Living program focuses on the individual needs of each resident and includes services and amenities for the resident who requires minimal assistance in carrying out the activities of daily living. Our Memory Care is all-inclusive and features a highly specialized program in our secured "Serenity Wing" for the residents whose needs are more unique due to memory loss or confusion. 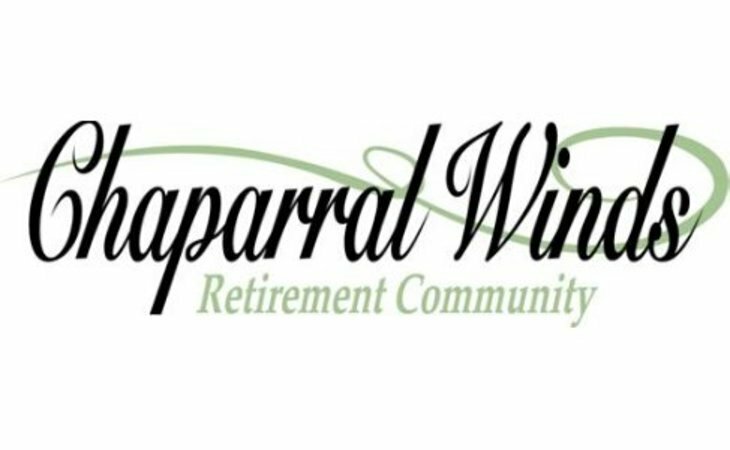 What should caregivers and potential residents know about Chaparral Winds Retirement Community?